In our past following articles, we’ve shown some useful articles on some funny commands of Linux, which shows that Linux is not as complex as it seems and can be fun if we know how to use it. Linux command line can perform any complex task very easily and with perfection and can be interesting and joyful. 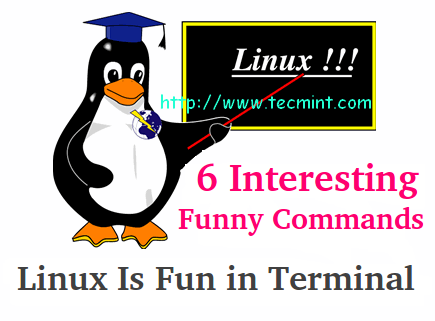 The former Post comprises of 20 funny Linux Commands/Script (and subcommands) which was highly appreciated by our readers. The other post, though not that much popular as former comprises of Commands/ Scripts and Tweaks which lets you play with text files, words and strings. This post aims at bringing some new fun commands and one-liner scripts which is going to rejoice you. You might have seen simulating text in movies. It appears as, it is being typed in real time. Won’t it be nice, if you can have such an effect in terminal? This can be achieved, by installing ‘pv‘ command in your Linux system by using ‘apt‘ or ‘yum‘ tool. Let’s install ‘pv‘ command as shown. Once, ‘pv‘ command installed successfully on your system, let’s try to run the following one liner command to see the real time text effect on the screen. Note: The ‘q‘ option means ‘quite’, no output information and option ‘L‘ means the Limit of Transfer of bytes per second. The number value can be adjusted in either direction (must be integer) to get desired simulation of text. How about printing text with border in terminal, using an one-liner script command ‘toilet‘. Again, you must have ‘toilet‘ command installed on your system, if not use apt or yum to install it. Note: The above script needs to be suspended using ctrl+z key. This command generates a random identity and address, every time. To run, this command you need to install ‘rig‘ using apt or yum. How about viewing an image in ASCII format on the terminal? We must have a package ‘aview‘ installed, just apt or yum it. I’ve an image named ‘elephant.jpg‘ in my current working directory and I want view it on terminal as ASCII format. In last article we introduced a command ‘oneko‘ which attaches jerry with mouse pointer and keeps on chasing it. A similar program ‘xeyes‘ which is a graphical programs and as soon as you fire the command you will see two monster eyes chasing your movement. Do you remember last time we introduced command, which is useful in output of desired text with animated character cow. What if you want other animal in place of cow? Check a list of available animals. How about Elephant inside ASCII Snake? How about Elephant inside ASCII goat? That’s all for now. I’ll be here again with another interesting article. Till then stay update and connected to Tecmint. Don’t forget to provide us with your valuable feedback in the comments below. Which rpm file is required for this commands? me to, I don’t know how to do.. I try to use the source code, it is more and more problem than apt-get. Which repo is needed for this ? I believe EPEL would work here! search for package aalib and install it. Let us know what u get? hello brother while installing rig command he says No package rig available. Very nice list of commands. I am surely going to try all of these. Keep Going to post such great articles.